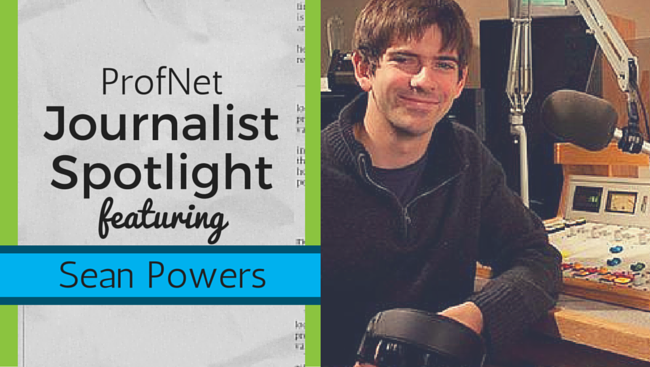 Welcome to Journalist Spotlight, where we go behind the scenes with a journalist and ProfNet user. This installment features Sean Powers (@SeanPowersGPB), a producer and reporter. Sean Powers is a producer for “On Second Thought” and Georgia Public Broadcasting‘s “All Things Considered.” A native of the south suburbs of Chicago, Powers graduated with a journalism degree from the University of Missouri. In 2012, he completed a fellowship at the UC Berkeley Graduate School of Journalism. After working as a reporter for the public radio station in Urbana, Ill., he moved to Atlanta, where he resides today. His reporting has earned him about a dozen Associated Press awards, two regional Edward R. Murrow awards, and four national PRNDI awards. Powers enjoys covering stories that focus on immigration, education and agriculture. We chatted with him recently about his career. Here’s what he had to say. Did you always know you wanted to be a journalist? From when I was 15 years old and got involved in my high school’s 1500 Watt student-run radio station. That’s WHFH-FM at Homewood-Flossmoor High School in Illinois. My first major assignment in my school’s broadcasting class was to produce a 55-minute radio documentary on teenage pregnancy. After several months of preparation, the program aired without a hitch. I immediately got swept up by the radio bug and the power of strong journalism that can reach out to a community. I’ve never looked back. Where was your first job in journalism? Unpaid: WHFH-FM (reporter for my high school’s radio station). Paid: Illinois Public Media (reporter for the NPR affiliate in Urbana, Illinois). What stories do you like to write and report about most? Stories I can’t relate to from my own personal experiences – LGBT rights, immigration, HIV/AIDS, homelessness, stories that force me to step outside my comfort zone. What do you like most about your role at GPB? It’s a huge change from my other jobs. I’ve been traditionally an on-air public radio reporter, and I’d work very independently. With this job, I’m mostly a talk show producer. So, I have to primarily work behind the scenes as part of a team of producers and a host. Those changes have been a huge challenge for me, but after a year, I’m finally getting the hang of it. What’s the biggest difference today from when you started your career? I’m not working for free anymore. How do use social media at work and what do you think is the best aspect of it? I use FB and Twitter a lot to find story ideas and sources, but I’m not big on updating my accounts. Can you tell us about one of the most memorable moments you’ve had covering a story? I recently volunteered with an Atlanta teen magazine called VOX Teen Communications, which includes high school contributors from all over the Atlanta area. VOX recently did a series on HIV in Atlanta, and I had the pleasure of mentoring two students who produced an audio story. Seeing them get excited about reporting was really cool. You have several accolades to your name – recognition from the AP and two prestigious Edward R. Murrow awards. Do you feel more pressure to outdo each story or do you not even think about the awards? I used to care about awards, but I’ve done some amazing stories that haven’t been honored and other stories that were honored but probably shouldn’t have been honored, so I’m at the point where I just care about the community I’m covering. If you get too focused on awards, you end up reporting for the wrong reasons. What advice do you have for new journalists and even for those who aren’t so new to the field? Jump into it. Don’t wait to be assigned a story in your journalism class or by an editor. Just get out in the community and start talking to people. That’s where some of the best stories are born. What advice to do you have for those in PR or anyone else who may want to pitch you a story idea? Localize the pitch. If you send it to a station in Georgia, find a way of connecting it to GA. Is an author going to be in town? Does he or she have a solid connection to the state? If you’re doing a pitch on obesity, find out how Georgia ranks compared to other states. A lot of pitches feel generic and not very appealing.